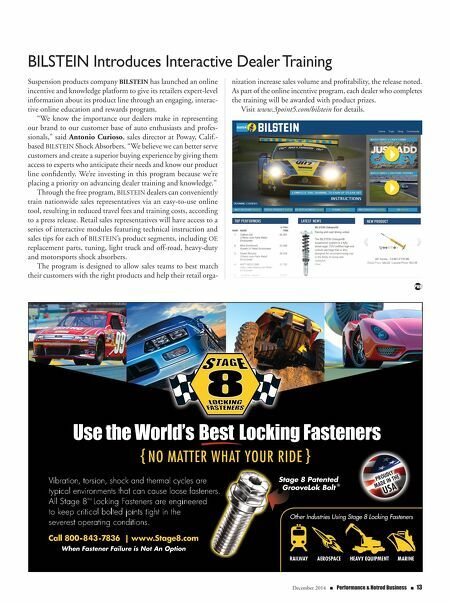 12 n Performance & Hotrod Business n December 2014 Rocker Sings Red Kap's Praises Automotive apparel manufacturer Red Kap has named Billboard- charting recording artist and Social Distortion front man Mike Ness as a brand ambassador. Red Kap will feature Ness in upcoming advertising and marketing programs in addition to future product collaboration, according to a press release. "Ness' prolific career has spanned decades, establishing him as an American punk rock legend," said Chris Holcombe, vice president and general manager of distributor brands, Red Kap. "His passion for car culture, clothing and all things vintage Americana make him an ideal fit for the Red Kap brand and where we are headed. We are excited to work with Mike Ness, and we know this will be a great partnership." The band's history includes seven studio albums, sold-out world tours and "an unrelenting determination to create something genuine and authentic," the release noted. "Everyone familiar with me knows that I'm no stranger to work wear, on or off the stage," said Ness. "I work hard and I play hard, so joining Red Kap as they take this step forward feels like a natural partnership. I'm looking forward to being a part of an American origi- nal that's been doing business for over 90 years." AWE Tuning Unveils Exhaust Brand AWE Tuning, Willow Grove, Pa., has trademarked its Helmholtz resonator technology under the newly launched brand AWE Tuning 180 Technology, and noted that future exhaust builds using the sound-cancellation technology will be stamped with the new AWE Tuning 180 Technology logo. The formula used to produce what has been called "an AWE Tuning signature tone" has been in use since 2010, but only now has the usage become so far-reaching across the company's product line that it decided to brand the technology, according to a press release. "The sound of our exhausts has become well-known as best in class—loud when you want it, civil when you don't—and much of that is due to the principles now summed up as AWE Tuning 180 Technology," said Jesse Kramer, vice president of marketing. The company described the creation of the new resona- tor technology: "As exhaust gases exit the engine and flow into an AWE Tuning 180 Technology-equipped resonator, they pass through strategically located ports, and into reflection cham- bers. Sound waves, carried by these exhaust gasses, bounce off the walls of the chambers. Depending on the sound requirements of each vehicle type, AWE Tuning acoustic engineers adjust the size and location of the ports and the chambers. By controlling the size and location of these key features, we control when the sound waves exit the cham- bers. The specific timing of when the reflected sound waves rejoin the main exhaust flow creates a 180-degree, out-of- phase sound wave that cancels out problematic frequencies." 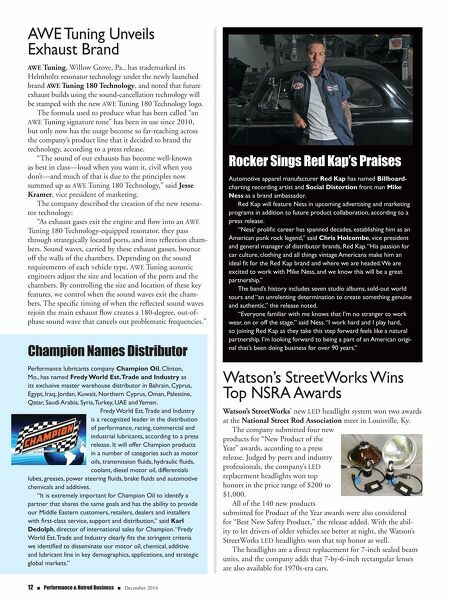 Watson's StreetWorks Wins Top NSRA Awards Watson's StreetWorks' new LED headlight system won two awards at the National Street Rod Association meet in Louisville, Ky. The company submitted four new products for "New Product of the Year" awards, according to a press release. Judged by peers and industry professionals, the company's LED replacement headlights won top honors in the price range of $200 to $1,000. All of the 140 new products submitted for Product of the Year awards were also considered for "Best New Safety Product," the release added. With the abil- ity to let drivers of older vehicles see better at night, the Watson's StreetWorks LED headlights won that top honor as well. The headlights are a direct replacement for 7-inch sealed beam units, and the company adds that 7-by-6-inch rectangular lenses are also available for 1970s-era cars. Champion Names Distributor Performance lubricants company Champion Oil, Clinton, Mo., has named Fredy World Est. Trade and Industry as its exclusive master warehouse distributor in Bahrain, Cyprus, Egypt, Iraq, Jordan, Kuwait, Northern Cyprus, Oman, Palestine, Qatar, Saudi Arabia, Syria, Turkey, UAE and Yemen. Fredy World Est. Trade and Industry is a recognized leader in the distribution of performance, racing, commercial and industrial lubricants, according to a press release. It will offer Champion products in a number of categories such as motor oils, transmission fluids, hydraulic fluids, coolant, diesel motor oil, differentials lubes, greases, power steering fluids, brake fluids and automotive chemicals and additives. "It is extremely important for Champion Oil to identify a partner that shares the same goals and has the ability to provide our Middle Eastern customers, retailers, dealers and installers with first-class service, support and distribution," said Karl Dedolph, director of international sales for Champion. "Fredy World Est. Trade and Industry clearly fits the stringent criteria we identified to disseminate our motor oil, chemical, additive and lubricant line in key demographics, applications, and strategic global markets."